From the bedroom in Sea Biscuit, the morning light seeps in through the open windows as you cuddle up close and enjoy the view over the ocean. This Thanksgiving, travel to Nevis and discover all there is to be thankful for. From the peace of the island to spectacular views to time spent undisturbed with the person you love, there is so much to be grateful for on this quiet Caribbean island. 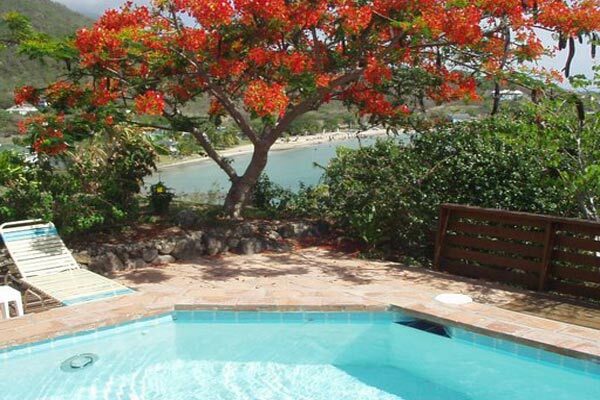 Sea Biscuit, part of Hurricane Cove Bungalows, is cozy and comfortable perched hillside near Oualie Beach. This one-bedroom bungalow is the perfect place to lay low, enjoy the magnificent sunsets, and simply bask in the peace and quiet. Watch the show as pelicans dive into the crystal blue Caribbean water, and enjoy the breathtaking views from the balcony. Idle lazily in the afternoons, swaying gently in the hammock as the Caribbean sun sparkles over the sea, and find perfect repose in the still of the island. For the Thanksgiving holiday, barbecue fresh fish on the grill- a meal befitting of a Caribbean Thanksgiving celebration- and watch the sun descent behind the horizon from the gallery at Sea Biscuit. As you recount all the things you’re thankful for, the gentle trade winds, the lap of tide, and the golden sunsets over the Caribbean will all come to mind.